As I start writing this, I wonder if I will end up apologising for it. You might think that I often wonder if my unfettered sarcasm and wholesale sprays of invective, combined with poor attention to detail will have that result, but you’d be wrong. It’s not that at all. My readers generally love that. My issue with this might simply be that I might be letting my readership down, because from where I sit, this might be a wholly positive piece. I’m not sure regular readers can take the shock. If you happen to be on Vancouver Island, then it’s an hour and twenty minutes from Victoria. Do it. If you happen to be elsewhere in British Columbia, then head to the Ferry Terminal south of Vancouver, get to Victoria then see instruction above. If you happen to be in any other province of Canada, get in your car or on a plane, get to British Columbia, then see instruction above. If you are currently in a country that is not Canada, then get to Canada, then see instruction above. If you are a tea person – a blogger, a retailer, a reviewer, then this is doubly important. Skip World Tea Expo or the Sydney Tea Fair or the birth of your first child* or your impeachment hearing or whatever else you had planned, and visit Westholme. At all costs. Well, unless the weather is not nice, and in Canada it can get stupidly not nice, but if the kind of rain, snow and sleet that the US postal service used to tweak the nose of is not evident, then just do it. Sitting in a bucolic setting late afternoon, as the day makes one last effort to warm the land, with opalescent dragonflies and drinking tea is enough reason for this, but of course, you can do that in many places, near many converted barns, in many multi-produce gardens on many afternoons. What makes this special is that firstly, you are just metres from 800 tea plants and secondly, Victor. The plants have suffered a bit. The aforementioned not nice Canadian winter quite rudely dumped large quantities of snow on them, and they really didn’t care for it. The balmy summer seems to be helping them, but they are still convalescing to an extent. More than a thousand more plants will be going in soon, and that will mean a fair bit more work for Victor. Victor is the co-owner. His partner Margit is a self-taught ceramic artist who makes incredible creations, including all the cups you use on site, and together they run the farm/tea shop/gallery that is quite frankly in the middle of nowhere. That fact that we could barely find a park on a weekday afternoon speaks volumes for the place. Sidenote: yesterday we visited the Venus Sophia tearooms in Victoria, which is just splendid**. Nice decor and really good staff, who really made an effort. I mentioned to our server that we had been at Westholme the day before, and her face lit up. She told me she had been there several times and it was “the best place to be if you love tea”. She immediately started planning another visit. But it’s not just a place for raging teaholics. Listening in to conversations around us, some people were just enjoying the experience without realising quite how unique it was. And that’s nice. Not everyone has to be a certified taster or highly opinionated tea blogger, you can just go there and understand that you are having nice tea in a unique cup, nice food and wonderful surroundings. The converted barn is ceramics gallery at one end, has a splendid range of single origin teas at the other (Puttabong Oolong, anyone?) and a tiny stand in the middle has the in-house product. With so few plants and a poor season, there’s not much of it. Damn. They have unique names: Quail’s Nest, Tree Frog to name a couple. There is a kukicha and also something smoked (I could not possibly review that. Smoked teas are Geoffrey Norman’s domain) but the one that drew my eye was Swallow Tail Oolong, a large loose, sweet smelling oolong. We took a seat on the sun drenched edge of the lovely outdoor area, and we ordered. 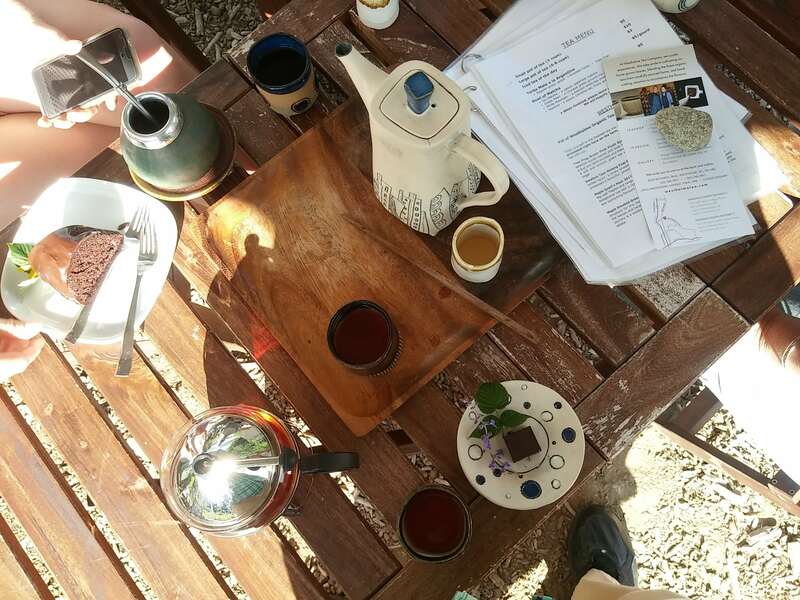 Our party ordered a Dian Hong and a savoury scone (me), raw choc hemp brownies and a (Yunnan) Golden Needle (Lady Devotea) a Chinese Silver needle of some description, a large piece of Earl Gray chocolate cake and, inexplicably, a chai spiced Yerba Mate served in a gourd. Victor also offered us the chance to try one of his creations, and we went with Swallow Tail Oolong. The oolong came out first and the first steep was nothing short of excellent. Tones of vanilla and walnut, I think, but the overriding agreement around the table was that caramel was the major note. Everything else came out then, and nothing was below par. Not by a long way. 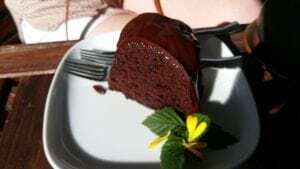 I didn’t try the brownie on the grounds of my chocolate allergy, or the cake on the grounds of my chocolate and citrus allergies, or the Yerba Mate on the grounds that it was Yerba Mate, but everyone who had anything pronounced it to be excellent. 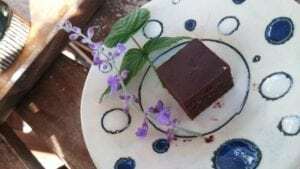 Raw Choc Hemp Seed Brownie thing- by all reports delicious. My Dian Hong was top notch but, as per the habit of a lifetime, Lady Devotea had once again out-ordered me because the Golden Needle was the best thing on the table, according to my black-tea-biased taste buds. The next half hour was hectic, as we swapped and chatted and soaked up the sun and the garden’s oxygen. Lady Devotea photographed a beautiful dragonfly, and on a large rock next to us, two huge zebra-striped bugs got about the business of making more zebra-striped bugs. And of course, we had a further steeping of the Swallow Tail. Again, we all thought it was great, maybe a little more savoury than the first one. The cups you can see in the various pictures are made by Margit, and they are full of the physicality of the maker, the resulting lines carrying the shapes of fingers and thumbs and are very unique and personal. The farm’s own teas, however, do not carry the physicality but rather the spirituality, the heart of the maker. It is obvious at every turn that Victor has poured his soul into these teas. He is both humble and driven. He gets advice from industry luminaries such as Nigel Melican. He reads the bloggers. He processes the tea. He inspires his customer-facing staff. He works the crowd. He makes the tea an extension of himself. We get that, as blenders we strive to do the same. You can do it when you merely make a cup of tea and some cake. It’s a unique experience when you are served in an unbroken chain from leaf to cup on the very estate the tea is grown on, by the tea maker. This has been a long post, and if you are still reading: why? Why have you not stopped to make your travel arrangements. All tea is better with the ones you love in perfect surroundings. The Swallow Tail, blind tasted, would be good. Tasted after hearing the story, it would be better. Tasted at Westholme, where heart meet art and turns up in a cup hand made a few metres away, it’s perfect. *If you are actually personally giving birth to the child I’ll give you a pass on this at this time. **Sorry, nothing to be sarcastic about there, either. Margit is from the same Danish island of Funen @jackie used to spend her time on as a child. We were just there visiting last month seeing the ports and towns. She used to spend her summers in a lovely summers house on the coast (which is still there). It really is a bit of a magical place. 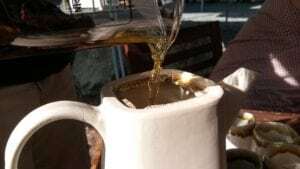 The way you describe it, Margit has successfully brought that Danish Hygge to a tea farm in Canada. Seems to me that she and Jackie would get along wonderfully. Funen is a small place so there would be lots to talk about. Thanks for this, I think I need to plan a trip north! Wish it could all be together. Surely we can get a study tour grant or something. The world is really small and even smaller around a good cup of tea. Nice place you found there. It really was fantastic, Xavier. Plan your next holiday here,many of them even speak French! That’s a very brief comment. You could elaborate. I am a frequent visitor to Westholme , and it’s lovely to hear that others are enjoying it….although I hope to be able to find parking when I go. It’s THE place that I recommend visitors (and locals) to go. Victor, Margit and the team are all amazing. Your article was well written and captured the ‘feel’ of Westholme . Thank you Lisa. If you liked that post, you will probably find the majority of the rest poorly researched, opinionated and waspish, but you never know.